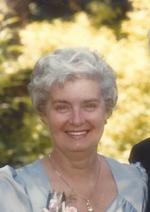 Doris Pound Obituary - Bowmanville, Ontario | Morris Funeral Chapel Ltd. The Memorial Candle Program has been designed to help offset the costs associated with the hosting this Tribute Website in perpetuity. Through the lighting of a memorial candle, your thoughtful gesture will be recorded in the Book of Memories and the proceeds will go directly towards helping ensure that the family and friends of Doris Pound can continue to memorialize, re-visit, interact with each other and enhance this tribute for future generations. Passed away with her family by her side, at home on Wednesday, March 21st, 2018 after a brief illness. Loving wife of Ted. Wonderful mother to Roy (Cheryl) and Dana (John). Special nanny to Megan, Joshua, Corinne and Andrew. Doris will be sadly missed by her siblings Linda (Jack), Maureen, David and Alan. Sister in law to Kitty (George), John (Lil) and Marie. Predeceased by her sister Sheila, brothers John and Roy, sisters in law Rose and Marge, and brothers in law Fred and Roy. Amazing auntie to many nieces and nephews. Fantastic friend to all. This is a Celebration of Life as Doris was a survivor. From evacuating London during the war as a teenager, numerous health challenges, a mother of two battling children and a marriage of almost 65 years. We as a family ask you to donate to any Cancer Foundation you deem worthy. Cancer has taken too many members of our family and friends. To send flowers to the family of Doris May Pound (Roberts), please visit our Heartfelt Sympathies Store.